In place of the normal trailers, they showed a short film talking about 9/11 and what happened at the festival in 2001. Although someone forgot to tell the projectionist for Lightbox 1 for Drive that. Drive: interesting film with a bit of an 80's vibe going on; esthetic reminded me a bit of Michael Mann. Gosling gives a good understated performance, but Brooks steals the show. Director Nicolas Winding Refn, Ryan Gosling, Bryan Cranston and Albert Brooks all made it to a Q&A after the film (alas, no Carey Mulligan or Christina Hendricks). In Conversation With Frances Ford Coppola: wide-ranging discussion with questions from Cameron Bailey and the audience, covering everything to his thoughts on how to deal with actors, how he learned to stand up to studios, to his winery, and his writing process. Coppola received a well-deserved standing ovation at the start and end of the session. I'm Yours: fun and dramatic road trip through northern Ontario with Rossif Sutherland and Karine Vanasse. Thought it was a nicely put together film. I couldn't stay for the Q&A with Sutherland and director Leonard Farlinger (Vanasse appeared before the film, but had to jet off for shooting on the ABC TV series Pan Am). The film was proceeded by Something Red, a fun little short from first-time director Ilana Frank, an EP on Rookie Blue, which explains the presence of Travis Milne, Missy Peregrym and Gregory Smith in the short and at the screening. Combined with seeing Charlotte Sullivan at last night's premiere of Edwin Boyd, I only need to find a film with Enuka Okuma to get the set. Headshot: latest from Pen-ek Ratanaruang (who is a pretty funny guy in real life), about a hitman who after being shot sees the world upside down. Liked the story of how the main character sees his life differently as his view changes, and was quite accessible, which is not always the case with films in the Vanguard program. Only problem was apparently the film was projected far darker than it should have been, so some of the scenes at night were difficult to make out. Hopefully that won't happen in other screenings. The Artist: a film about a silent screen star that can't cope with the advent of the talkies. Shot as an actual silent movie with no dialog, this was a really clever move that produced a really touching and funny story. Hard to believe you can get a compelling 90 minute movie with no speaking, but director Michel Hazanavicius does it with aplomb. Killer Elite: couldn't get more star power than having Robert De Niro, Jason Statham and Clive Owen on stage at once. But I was actually there to see Yvonne Strahovski (from TV's Chuck), and she didn't disappoint. :-) She even managed to change at some point between the start and end of the movie! The film itself was action packed, but was a bit awkwardly structured at the start, and I'm not quite sure I bought the Featherman as this all-powerful Illuminati-like cabal, at least from how they were portrayed. But I enjoyed the interplay between all the characters, and De Niro's turn, while nothing taxing, reminded me a little bit of his role in Ronin.Owen and Statham played well off of each other. Strahovski's part was a 180 from Sarah Walker, and I wish the script gave her more to do, but she acquitted herself well with what she had, including sharing scenes with De Niro. Burning Man: Matthew Goode does a great turn as a chef plagued by his own inner demons as he comes to terms with a tragedy in his life. The film jumps around quite a bit in time and as such is a bit hard to follow at the start; by the end the rhythm settles and you can see everything come to together. Edwin Boyd: Based on the real life exploits of a Canadian bank robber, the film features Scott Speedman as the title character. Speedman really digs into the role and you can see his struggle as he finds his way to criminality first as a means to support his family, and then as he begins to enjoy the noteriety. Also features Kelly Reilly (who I recognized but struggled to remember from where, until I remembered her as Caroline Bingley in Pride and Prejudice and Mary Morstan in Sherlock Holmes), Brian Cox, Kevin Durand (who's old Toronto vocal coach happened to be in the audience), Charlotte Sullivan (who I recognized from Rookie Blue), and William Mapother. Urbanized: the latest from documentarian Gary Hustwit (Helvetica, Objectified), the film takes a look at urban design around the world, from the US to South America, from Europe, to Africa, and to Asia. A fascinating look at how the organization, or lack thereof, in how a city is built can affect communities, societies, and the environment. The film was well-received by the packed crowd at the Ryerson. Hustwit himself, who stayed for a Q&A, was quite well acquainted with the urban planning challenges we have here in Toronto, including the mayor's recent attempt to throw out the current, long-in-the-works plan for the waterfront with a completely different one that he somehow thinks can be in place in six years. Probably the biggest hit in the film was the former mayor of Bogota, who talked of the city's move to put transit and cyclists front and center. If you care about having a vibrant, livable city, this is one to see. Elles: an interesting film, but can't say too much about it as I was unfortunately sitting behind the tallest person in the theatre so I couldn't make out much of the subtitles and my French is rather limited. Juliette Binoche did appear, as did director Malgoska Szumowska. I'll have to catch this again at some point. Sons of Norway: at turns funny and dramatic, this film from director Jens Lien (The Bothersome Man) showcases the story of a young boy who turns to punk to cope with a tragedy in his life. Also features a cameo by John Lydon (aka Johnny Rotten) who joined Jens Lien and writer Nikolaj Frobenius on stage afterwards for a Q&A. Lydon said he rarely if ever puts his name behind anything, but he was really committed to this film. Pina: I'm not into modern dance, but if any film can make me a convert, it's this one. Wim Wenders did a Q&A after the film, and you can tell this was a labour of love for him and Pina Bausch's dance company. The use of 3D is not overwhelming, and is effective in giving that added layer of depth that makes the dance movements stand out. From Up on Poppy Hill: intentionally not as fantastical as Studio Ghibli's other output, it's a nice little coming-of-age/love story, although a little bit thin on plot/drama except for the main obstacle that arises between the leads, which in and of itself is a bit out there (and which the film itself knowingly acknowledges). Still enjoyed it and was a nice break between some heavier films. The Raid: probably the best martial-arts action film I've seen in a long time, and puts anything coming out of North America to shame. Great fight choreography that is well shot and framed so you can see all the movements and action. The new Cadillac and RBC trailers were funny and a nice change, although I think the RBC ones will get tired quicker. The new volunteer trailer was fun; wouldn't want to cross Deepa Metha. Last year they were plugging an upcoming Tim Burton exhibit at the Lightbox; this year it's Grace Kelly. They really have to work on their line management at the Lightbox. We were queueing for Poppy Hill, and they had the line doubling up on itself multiple times; credit the volunteers and the crowds from keeping things getting ugly, but they should fix the whole situation fast. Don't lose your 3D glasses! They'll charge you $10 if you do. A tote bag, co-sponsored by Timberland. The material seems flimsier than last year. 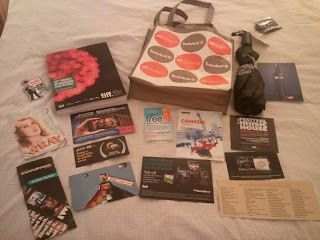 The big thing in the bag this year was a GO Transit umbrella. GO Transit is our regional transit agency in southern Ontario. A RBC TIFF fridge magnet. An ad for the TIFF Festival Music House, which allows filmmakers (not the public) to listen to Canadian bands. This year, K'naan, the Sam Roberts Band, The Rural Alberta Advantage, and Lights are just some of the artists that will be performing. The card had a link for a free music sampler, but when I tried it today, the link didn't work. An ad for Skyy Vodka. A visitor's guide pamphlet for the Toronto entertainment district, the area bounded by Spadina, Bay, Queen, and Front Streets. A Bell Blackberry ad, with a discount of 50% of any new Blackberry purchased during the festival, and QR codes for apps. A postage-paid postcard with a picture of actress Fay Wray. I think this is from Canada Post. An ad for Canada Post for their app that allows you to send a physical TIFF postcard from your smartphone. An ad for the National Film Board of Canada. A coupon for one free McCafe product from McDonald's. A coupon for one free digital download from HMV. An ad for Telefilm Canada. No food products, no samples, and I think Stella Artois has long given up on the beer glasses from previous years. The GO Transit umbrella is nice, though.